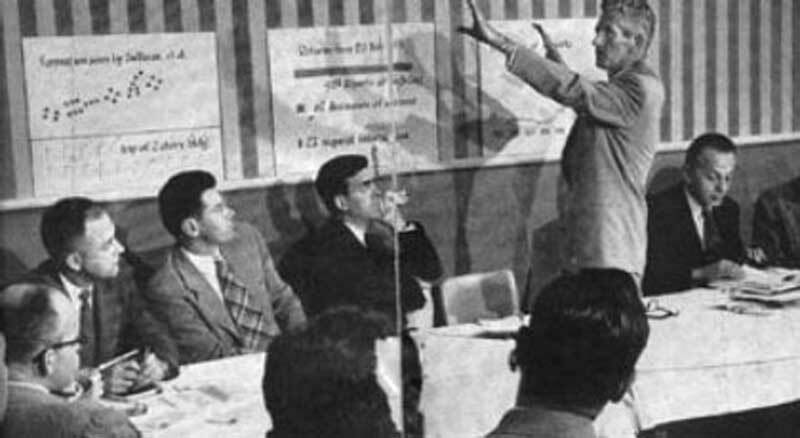 “Civilian Saucer Investigations” was organized by Sighter Ed J. Sullivan (standing), who urges other sighters to write to P.O. Box 1971, Main Post Office, Los Angeles. CSI includes Dr. Walter Riedel (behind Sullivan), who was chief designer at great German rocket laboratory at Peenemunde. It is unclear which Dr. Walter Riedel this is. According to some sources, Walter “Papa” Riedel — head of the Design Office at Peenemünde and Chief Designer of the A4 (aka V2) rocket — immigrated to England, and never worked in or visited America. The Walter Riedel cited by LIFE (1952) and Popular Mechanics (1954) worked with North American Aviation, who, in the Southern California Technical Research Laboratory, were working on re-engineering the V2 rocket.